It's July and summer gardens still have lots of color... though a different quality than springtime, different kinds of flowers, too. Days are running long. By July and August, some flowers start looking a little tired. But there are still great photo opportunities out there. This is the time to put your creative streak to work because the lush, thick growth of spring is done and summer gardens might be sparse and straggly in some areas. But, believe me, the pictures are there. Butchart Gardens near the restaurants. Get delicious Spumoni treats here, then take pictures of the baskets and your cool summer treat. Look for curves, lines and angles in the garden scenes... the curve of a path or a stream, the edge of the perennial garden or tall hedges in the background. 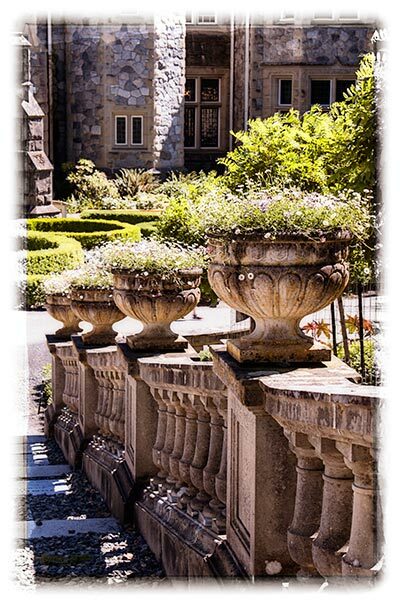 In this photo, at Hatley Castle on Vancouver Island, there are lots of parallel lines and curves in the bushes and the shape of the concrete planters. Summer planters in front of Hatley Castle. The summer (and spring) gardens are worth a full day's visit. The grounds cover a large area and include an Italian, Japanese and rose garden. Hatley Castle is in Colwood, near Victoria BC. It's now part of the Royal Roads University. Originally a home constructed for the coal baron, James Dunsmuir. In 1940 the entire property was acquired by the Government for HMCS Royal Roads to train the Royal Canadian Navy. Then, after the cold war and financial cutbacks, the Government decided to "de-militarize" the military college. It became Royal Roads University. The concrete fence makes a diagonal line across the photo and the wall appears to get smaller. That's perspective. A picture is only a flat 2 dimensional scene but our eyes perceive the image as 3 dimensional. Repeating patterns are another way to make your photo interesting. The wall is made up of repeating intricate shapes and it guides you toward the castle. Hatley Park National Historic Site needs at least a full day if you want to cover all of the gardens and the castle. The property is 565 acres or 2.29 square kilometers! Just sayin' - be prepared for lots of walking and give it a full day. Oh, and the movie industry loves the castle, too! If you're a McGyver fan, there was an episode shot there, also X-men and Smallville (Lex Luthor's estate). I loved the weekly Poltergeist and recognized the castle as their headquarters. If you want a full list, check it on Wikipedia... it's quite extensive. I spent 11 years in Korea and learned so much about the traditional tea ceremony. The Asian countries have some differences in their cultural practice of tea ceremony but basically it's similar. Tea ceremony is synonymous with Asian gardens. Traditional Asian gardens were designed to be very natural, simple and relaxing. Now, you might find some designed with a more radical approach. But they're all built around nature's elements of water, rocks and sand. Bridges can be rock, wood or logs, flat or rounded, but if the garden is associated with a temple, the bridge is traditionally painted red. 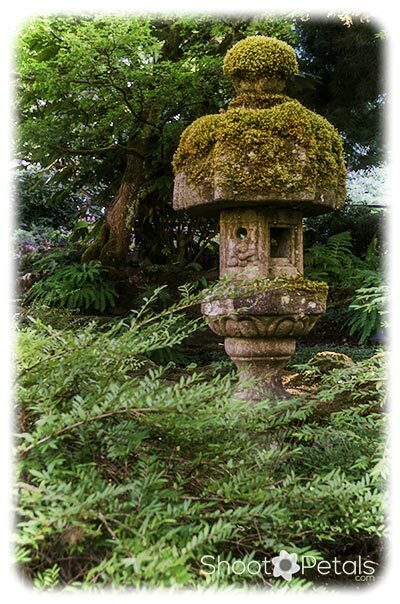 Stone lantern in a Japanese Garden. The bottom touching the earth represents "chi", then upward is "sui" or water, then "ka" around the fire and finally air "fu" and spirit "ku" above the flame. Everything about a traditional Asian garden is natural, not like the formal European garden. When you plan your photos, it's good to keep that in mind and build your photo story around that. Japanese summer gardens are cool and soothing. Stone lanterns were originally only located at Buddhist temples but later they were brought into tea gardens by the great Tea Masters. Now they're in most Japanese gardens just for decoration... and fascinating to photograph. The stone and the moss on these lanterns provide nice contrasting colour and texture and they're made up of intriguing patterns and shapes. Walk around to find the best angle and background. I wanted this image to show the verdant, rough terrain surrounding the lantern. But, I didn't want the lantern to be so small that it gets lost in the picture. It's not in the middle of the photo... it fills the upper two-thirds and it's large enough so you know it's the main subject. Learn something fascinating about all the subjects you photograph. When you know the story behind the lantern... what all the parts of it mean as well as a bit of history... your photo is more engaging and there's a story to tell (and impress) your friends. So much that I said about Japanese gardens also applies to traditional Korean summer gardens. They're simple and nature is encouraged to express herself openly. Water is an important part of any Asian garden. A traditional Korean garden in Yeomiji Botanical Garden, Jeju Island, South Korea. Traditional Asian gardens are "natural" and not formal like European gardens. This is one of six outdoor gardens at Yeomiji Botanical Gardens on Jeju Island, South Korea. The concrete and wood man-made structures dominate the right third of this summer garden image. The concrete walkway makes a nice vertical line leading your eyes to the temple. The temple sits on the top right 1/3 intersection. 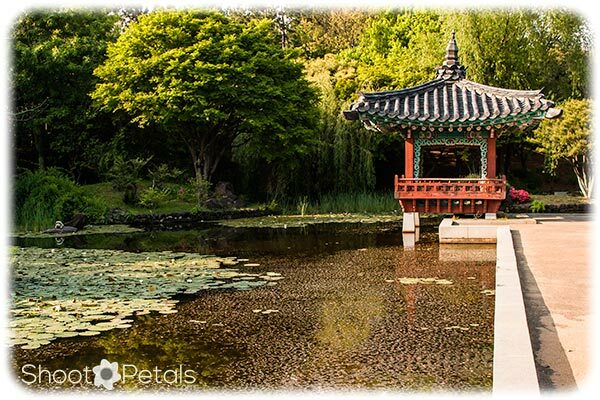 Nature takes up an entire two-thirds of the picture and shows how important both water and peacefulness is to the Asian garden. Are you a realist or an artist… or both? This is the part where you learn how I created some of my pictures of summer gardens. If you can press a shutter, you can learn basic photo editing, Download a free or inexpensive lightweight "model" and start playing. Crop, boost the saturation, change the white balance a tad. Some of my photos only get a few tweaks but I'm totally hooked on manipulating pixels! Abkhazi Gardens... not well known but what a gem! It's on Vancouver Island, in Victoria, previously a private home and gardens of the exiled Georgian Prince Abkhazi and his wife, Peggy Pemberton-Carter. It's now owned by the Land Conservancy of BC. It's the stuff of fairy-tales and you can read about it here. Read it before you visit.Then stroll around the garden, sit on the patio and feel the presence of these unlikely sweethearts. 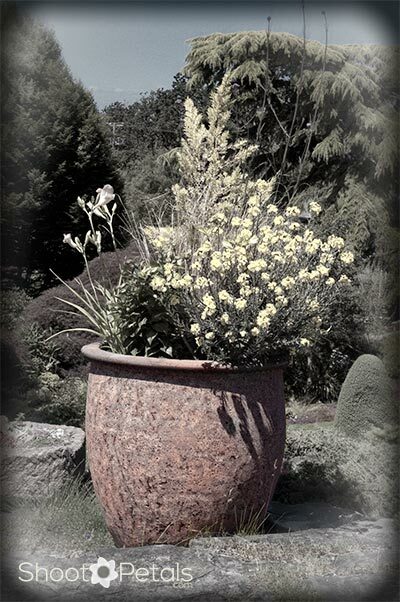 This pretty ceramic pot sits on the patio at the house. Sit back and relax over lunch... they offer a very tasty menu. Take time out from your garden photos to soak up the warm sunshine... indulge in a glass of wine.View the garden from a higher perspective to get ideas for more photos. This image: A few texture layers and a darker edge for a framing effect. The textures neutralize the colour. I blurred the edges of the photo... the pot and the plants are in sharp focus because they're the main subject. A large garden patio potted plant at Abkhazi Garden, Victoria. Take time out from your photography for a relaxing and tasty lunch. It's a high view all around the garden so you can plan more shots. If you think Shangri-La is a place that exists only in a novel, you're wrong! This is Doris Duke's home in Honolulu. She was an American heiress (1912-1993) who fell madly in love with Islamic art and Hawaii. For nearly 60 years, she planned and executed the building of this amazing residence and summer gardens. The home boasts over 2600 pieces of Islamic art from all over the world. It's a must-visit historical home. You're welcome to take photos outside but not inside the residence... unless you're a member of the press or a travel-writer and you make arrangements to attend one of their journalist tours. 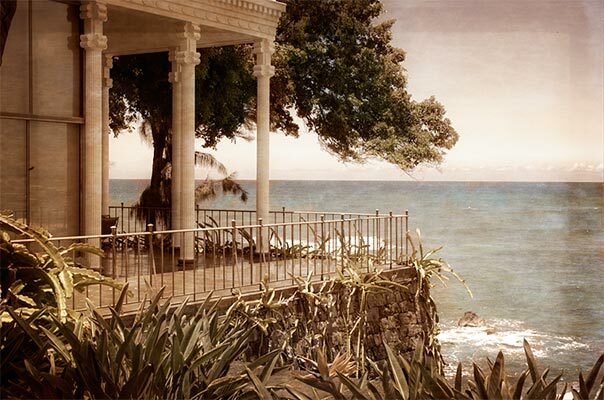 Doris Duke's stunning home and gardens, Shangri-La, Honolulu. A 60 year endeavour with 2600 pieces of Islamic art. Photo edited in Photoshop to make the image look weathered. A few texture layers in Photoshop to give this photo an aged feeling. It looks like it's printed in an old book. I used a wide brush to "paint" the darker frame appearance all around the edges. 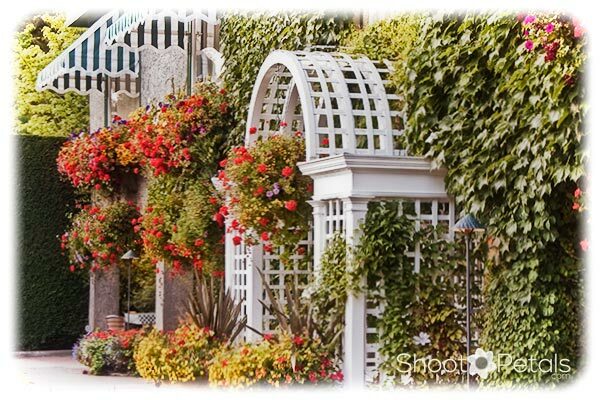 On to Vancouver Island and a very well-known botanical garden... Butchart Gardens outside of Victoria. The Children's carousel is one of the main attractions in this botanical garden and this bronze mare adorns the walkway just outside. 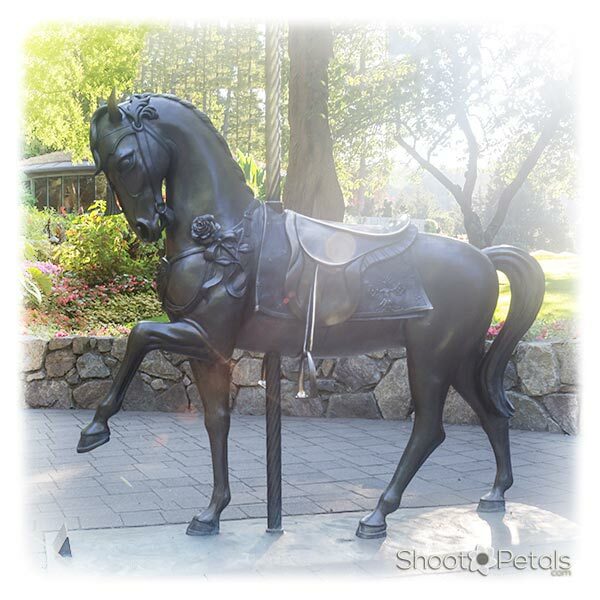 Butchart Gardens, a metal mare near the Rose Carousel. There is sun flare from the top wtih bokeh. The image is edited in Perfect Photo Suite. The rays of sun and bokeh are real... they're not edited in. But I added white vignetting around the edges and then a white frame. For awhile now, "light leaks", bokeh and rays of light have been very popular in photos of summer gardens. Not long ago they were considered to be mistakes. Creative photography means that anything you like is okay. Express your photo your way! To create an image exactly the way you want means you must know about exposure and composition. And you have to know your camera. If your photo was a fluke, then you can't reproduce the look again and again. Knowing your photography theory means you can consistently create an image the way you visualize it. Like this temple in Thailand. This is the Royal Flora Ratchephruek in Chiang Mai a few years ago... an international flower exhibition of gigantic proportions. And darn... it was hot and humid in this summer gardens extravaganza and it was only January! 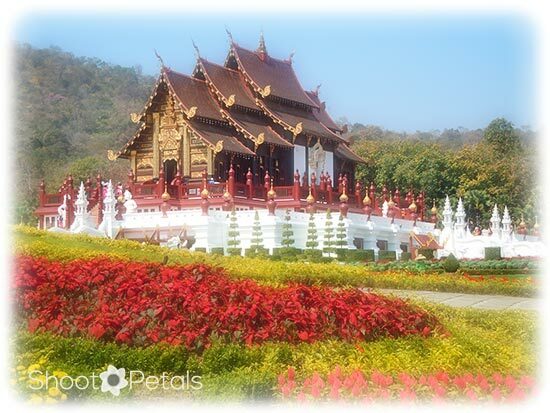 The Royal Temple, Royal Flora Ratchephruek in Chiang Mai, Thailand. Edited in Photoshop with a radial blur and lightened around the edges. This is the Royal Temple, at the centre of the exhibition. It's surrounded by several large fields of flowers and a pond that reflects the brilliant coloured blossoms. This photo was taken with a Nikon point and shoot so it's a JPG. The quality is nowhere near the quality of a RAW image but it was fun to work with in Photoshop. In a JPG, the camera has already compressed the image and the pixels are "cooked". Everything you do in a photo editor is destructive so be gentle! Reminder: Work on a copy and not on your original file. Keep your original pristine and safe for future editing. And use layers so you don't alter the background image. With layers, everything is changeable as many times as you. Save it only as a PSD (or TIFF) file to preserve the layers if you want to change them in 2 minutes or next month. When you save a finished version, use SAVE AS, not SAVE. "Save as" saves a copy (usually a JPG to put on the internet) but leaves all the layers intact as a PSD. Now we're in Honolulu at Foster Botanical Gardens. There are several botanical gardens on Oahu so there's lots of garden photography time. 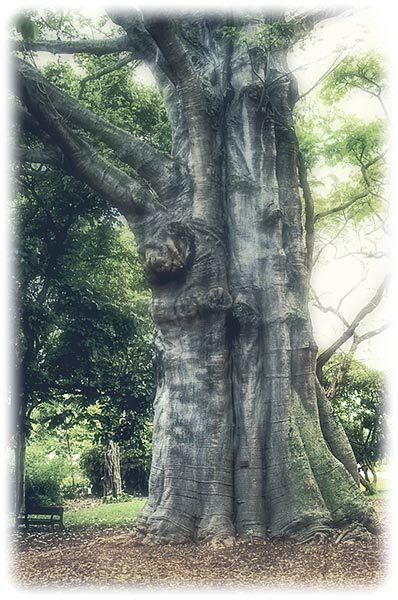 This Baobab is such an amazing tree... planted approximately 1940. Just look at the size of the park bench and imagine how gigantic it is. If the bench weren't there, how would you know it was so large? Include people or other items that give some perspective to your scene. To edit this photo... minor tweaking the RAW file in Photoshop and then into Perfect Photo Suite for some texture layers. The texture gives an antique feel. The photo looks a bit weathered... which highlights the age of the tree. Once I discovered all that's possible with an iPhone camera, I bought an iPhone 5s. I've used it more often than my DSLR in the past year... mostly because it's the one I have with me at the moment. The photos and video are such high quality, though the images are JPG and not RAW... at least not yet! The iPhone 6 has an even better quality camera and the next version will improve even more. This is an iPhone 5s photo. You'd be amazed at how many photographers use their cell phone cameras! Photographers like to play with all the apps on their cell phones, too! And with the constantly improving quality of phone cameras, iPhoneography is more and more becoming a creative option. I didn't use any of my phone apps to edit this photo but there are many that I use often. 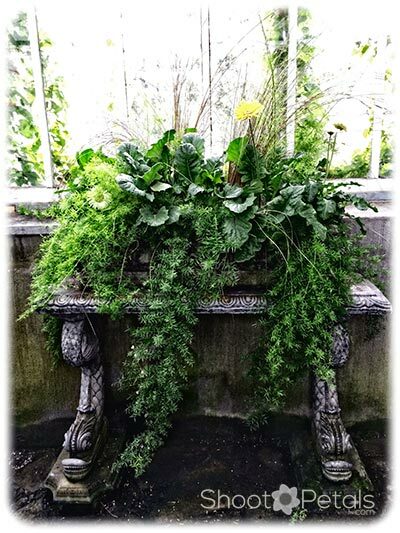 Stone Bench and planter in Allan Gardens, Toronto. A greenhouse or a conservatory is an excellent place to get in some summer garden photography. Still in the Toronto area, let's take a short ferry trip to Toronto Island. You catch the boat at the Jack Layton Ferry Terminal at Queen's Quay West. There's a great view of the downtown Toronto skyline and the CN Tower all the way across. Now we're on Toronto Island scouting for more summer gardens. There are several areas worth photographing. 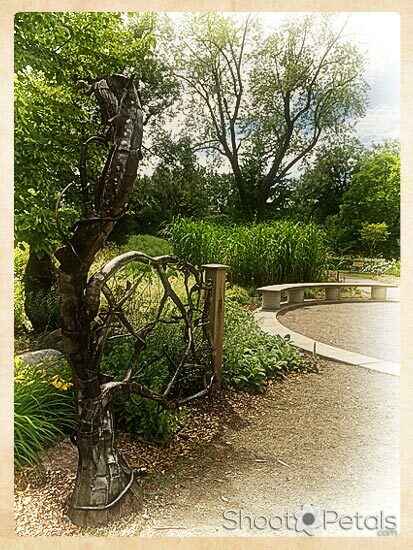 This is the gate to the Children's garden... so pretty and worth a picture. There was a garden of lemon yellow frilly daylilies and some vibrant orange-red coreopsis. If you have children, visit the Franklin Children's Interactive Garden... get some photos of them during storytelling or gardening. The gate to the Children's Garden, Toronto Island. There are several pretty summer gardens on the island and a view of the CN Tower across the lake. Always a perfect choice for photos... roses in summer gardens. This is the rose garden in Queen Elizabeth Park. And it's from my iPhone. This image is edited in Perfect Photo Suite on my Mac but I also edited it a few different ways in Snapseed and Camera+ on my iPhone. Orange Roses in Queen Elizabeth Park... image taken with an iPhone 5s. Photo edited in Perfect Photo Suite. I believe roses were made for cameras. You can't pass by a rose garden without stopping and appreciating them. Get there when they're in full glory. Don't let the summer gardens get exhausted and droopy. June and early July are best, at least for the rose gardens in Canada. An exception is the old roses that just on keep "giving". Not so for the delicate tea roses. Panoramas are the best thing since sliced bread! There are several apps and various ways that the apps stitch the images together. Try a few out and see what you like. They all take a bit of practice, knowing how to hold your camera and getting used to the quirks of each app. I used the app that came programmed into my iPhone 5s for this shot of my friends summer garden on her patio. And, of course, you can also take several individual photos and then take them into Photoshop or a dedicated panorama stitching editor. I've put several together in Photoshop and got excellent results. You can easily triple the number of pixels in your files with panos. That means you could get a nice print. There are some tricks to getting images that your photo editor will easily be able to work with. Hostas on my friend's patio in Burnaby, BC. This is several images blended into a panorama in the cell phone pano app. The edges are lightened and blurred in Perfect Photo Suite. The science behind panoramas boggles my mind and every time I create one, I'm amazed... even if it's not the best result. I understand the concept but the math is way beyond me. Wow, technology is so cool. You might want to check out the apps that I've tried out... but hey, there are many more. And if you have an android, you'll find panorama apps for them as well. The brilliant sun and mid-day heat aren't the best conditions for getting good photos in summer gardens. With a clear sky and the sun beating down on the flowers, you'll get harsh shadows and the garden may look a bit exhausted. If your favorite botanical garden doesn't open until 9:00 or 10:00, you'll miss one of the best times of the day... very early morning. The other perfect time is after 4:00 or later. The sun is cooling off a little and a lot of the garden will be shaded by the larger plantings. Light shade is the best for photographing outdoors, unless you're taking video. Get to the garden you want to photograph a few hours earlier and walk around. Take a notebook and write down the places and scenes, or specific flowers you want to shoot. Sometimes, I go around once and take video and that's my "list" for my second go-around for pictures. Summer at Butchart Gardens. 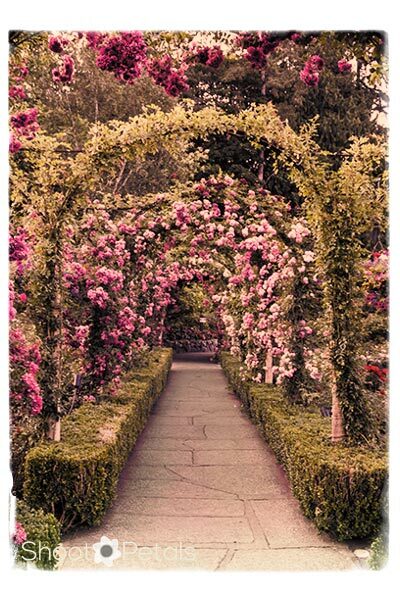 The walkway of arches with roses in bloom. The rose garden will keep a camera busy and I find the best time is after 4:00 when the sun is lower. My final image for summer gardens is the beautiful rose arches at Butchart in Victoria. 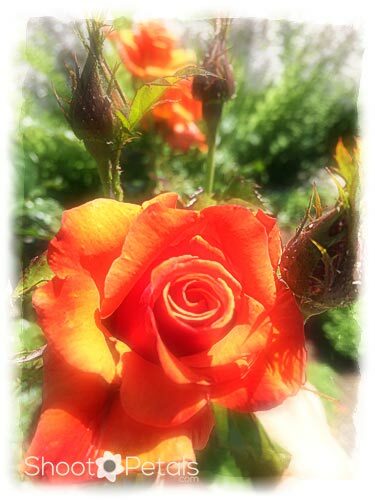 The old fashioned roses got an "antique" style photo editing. The colour looks a bit faded and slightly weathered. So that's the last of my photos and you should be prepared to go out, use some of the information here to get your own. Then play with them in your photo editor. And most of all, enjoy your time with the flowers.